Everyone has places they go to in their daydreams. 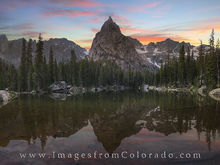 Indian Peaks Wilderness and Lone Eagle Peak is one of those places for me. Between Winter Park and Grand Lake, Colorado, in Grand County, just off Highway 34, a dirt road takes you ~ 15+ miles around the south side of Lake Granby. At the end of this drive, a hiking trail takes you around pristine Monarch Lake. An easy 4-mile footpath circles this lake, taking hikers up and down the trail, over clear, cold streams filled with brookies and cutthroat trout, and back to the parking lot. This area is often filled in the summer with folks out enjoying a stroll in the Rocky Mountains. However, if you want more adventure, instead of turning right at the 1.5-mile mark of the Monarch loop, and continue on Cascade Trail as switchbacks take you alongside Buchanan Creek. That’s why my best friendand I did. We found ourselves virtually alone in a matter of minutes as few hikers were willing to travel any further. In the summer, we found wildflowers filling the meadows along the trail. Cascades lined the trail for several miles. 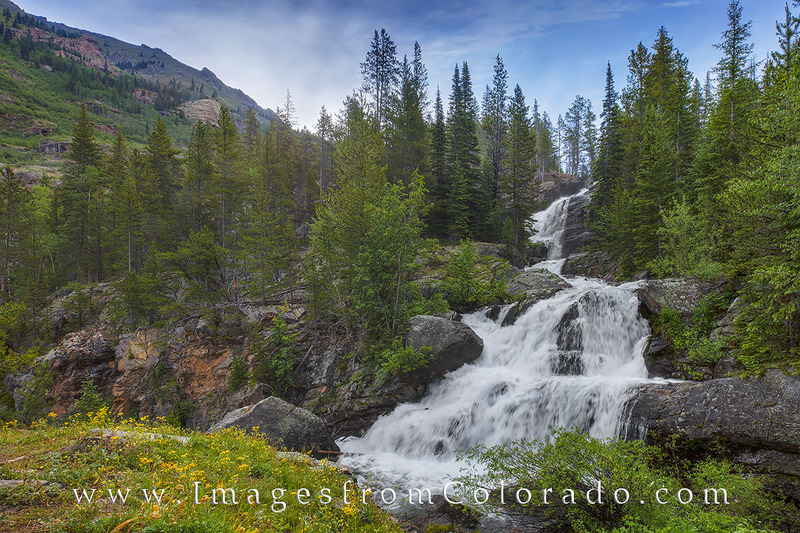 Here, at the 5 mile point, one of the many waterfalls added a nice background as Colorado wildflowers add color to the landscape. On the way to Mirror Lake and Lone Eagle Peak, the trail follows Cascade Falls for several miles. These Colorado wildflowers were growing on the rocky shores of Cascade Creek, filling the landscape with color and beauty. At around the 6.5-mile mark, we took a right (staying on the Cascade Trail) and started the grunt up a thin, rocky corridor to reach the next plateau. Though we only had 1.5 miles to go to reach Mirror Lake, the trail was tough as rains had added the element of slick rock and mud to our ascent. Though there is no danger of falling off cliffs in this hike, the slippy rocks did offer multiple opportunities to damage an ankle or knee. Carefully, we worked our way up until we reached a meadow. From that point, it was only a few easy switchbacks to reach this beautiful lake. Eight miles of walking paid off with beautiful views of the truly unique Lone Eagle Peak. Though it is not even a 13er, this rocky mountain in the Indian Peaks Wilderness is an amazing sight, surrounded on all sides by steep summits and blue sky. Comprised of nine images stitched together to show the wide angle beauty this is found here, this photograph attempts to capture the solitude and reward of a long trek. For the next several hours, we hung around while my friend allowed me time to do my work – photographing Lone Eagle Peak and its reflection in the still, clear water of Mirror Lake. As night fell, colors of the sunset lit up the cooling air, and soon the Milky Way was rolling across the sky. 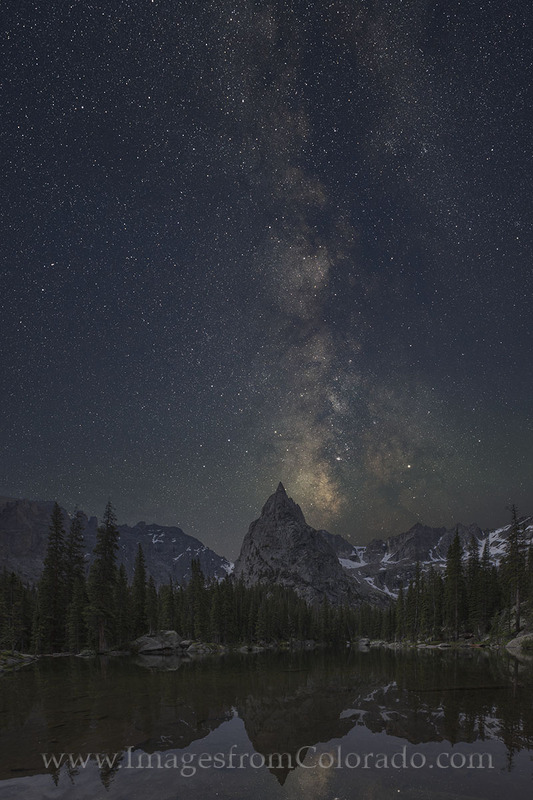 In mid June, the Milky Way rises in the south over Lone Eagle Peak. 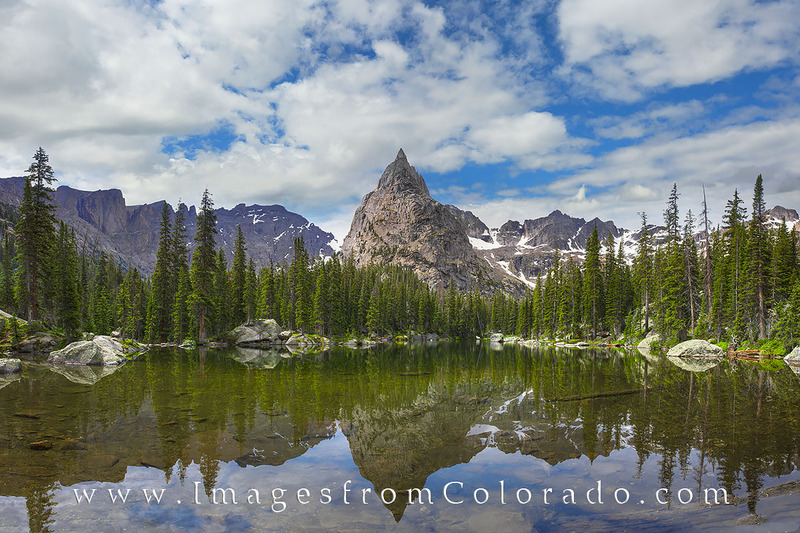 The reflection of this remote peak in the Indian Peaks Wilderness area in Grand County is nearly perfect in Mirror Lake. While the hike here is long - ~ 16 miles round trip - the Colorado landscape here is unique and stunning and well worth the sweat. I will be the first to admit the walk back was tough. Sometimes I think I’m getting too old to hike 16 miles, much less carry my equipment that far. My feet hurt the next day, and I found I had worn holes in the sides of both shoes. Still, I was better for having experienced such a beautiful location first hand, and even shared that time with a life long friend. One of these days I hope to take my wife there, but I’m not sure if either of us would make it 16 miles again! Until then, I’ll keep shooting the sights a little closer to home. But I have returned many times to this magical place in my daydreams!